This article is about Society Hill (disambiguation)|Society Hill. For other uses, see Society Hill, Philadelphia (disambiguation). Head House Square, 400 block of S. 2nd St.
Society Hill is a historic neighborhood in Center City Philadelphia, Pennsylvania with a population of 6,215 as of the 2010 United States Census[update]. Settled in the early 1680s, Society Hill is one of the oldest residential neighborhoods in Philadelphia. After urban decay developed between the late 19th and early 20th centuries, an urban renewal program began in the 1950s, restoring the area and its many historic buildings. Society Hill has since become one of the most expensive neighborhoods with the highest average income and second highest real estate values in Philadelphia. Society Hill's historic colonial architecture, along with intelligent planning and restoration efforts, led the American Planning Association to designate it, in 2008[update], as one of the great American neighborhoods and a good example of sustainable urban living. The neighborhood contains one of the largest concentrations of original 18th- and early 19th-century buildings in the United States. 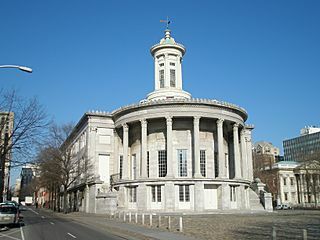 Society Hill is noted for its Franklin street lamps, brick sidewalks, cobblestone and Belgian block streets bordered by two- to four-story brick rowhouses in Federal and Georgian architecture, and public buildings in Greek Revival architecture such as the Merchants' Exchange Building and the Old Pine Street Church. Society Hill was initially known as the Dock Ward, a designation that fit it until well after World War II when the shipping industry declined and relocated. 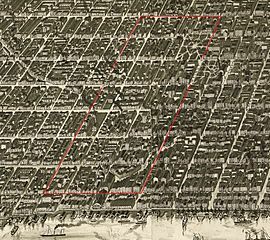 The Dock Ward, first defined in 1705, was one of the ten original wards that the city used to subdivide land east of 7th Street. As part of the 1854 Act of Consolidation, the Dock Ward was renamed the 5th Ward. The wards were realigned in 1965 and the boundaries of the 5th Ward no longer correspond to Society Hill's boundaries. The land area of Society Hill is approximately 0.254 square miles (163 acres). Bordering the Delaware River just south of Old City and Independence Hall, Society Hill is loosely defined as bounded by Walnut, Lombard, Front and 8th Streets. The Society Hill Civic Association further subdivides Society Hill along Spruce Street and 4th Street into quadrants by intercardinal directions: northeast (NE), southeast (SE), southwest (SW), and northwest (NW). Across different sources, variation in the exact border includes extending the eastern boundary to the Delaware River, the southern border to South Street, the northern border to Chestnut Street, or limiting the western border to 7th Street. With prime access to the Delaware River and Philadelphia's civic buildings, including Independence Hall, the neighborhood quickly became one of the most populous areas in colonial Philadelphia. Several market halls, taverns and churches were built alongside brick houses of Philadelphia's affluent citizens. Dock Creek came to be the public sewer. After the Revolutionary War, the city filled in the polluted Dock Creek, and created a new food distribution market on the street created by filling in the creek. Dock Creek became Dock Street. Though the streets of Philadelphia were carefully laid out in a grid, the new Dock Street’s arc connecting Chestnut and Spruce Streets between 2nd and 3rd, owes its uncharacteristic shape to the path of the former creek as it ran to the river. In the 19th century, the city expanded westward and the area lost its appeal. Houses deteriorated, and by the 1940s, Society Hill had become a slum neighborhood, one of the worst in the city. In the 1950s, the city, state and federal governments began one of the first urban renewal programs aimed at the preservation of historic buildings. While most commercial 19th-century buildings were demolished, historically-significant houses were restored by occupants or taken over by the Philadelphia Redevelopment Authority and sold to individuals who agreed to restore the exteriors. Replicas of 18th-century street lights and brick sidewalks were added to enhance the colonial atmosphere. Empty lots and demolished buildings were replaced with parks, walkways, and modern townhouses. 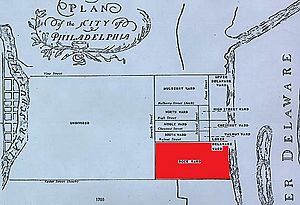 From 1957-1959, the Greater Philadelphia Movement, the Redevelopment Authority and the Old Philadelphia Development Corporation bought 31 acres (130,000 m2) around Dock Street. They demolished and relocated the Dock Street market, setting aside 5 acres (20,000 m2) of land that would become the Society Hill Towers. In 1957, Edmund Bacon, the executive director of the Philadelphia City Planning Commission, awarded developer-architect firm Webb and Knapp the competition for the redevelopment of Society Hill. Architect I. M. Pei and his team designed a plan for three 31-story Society Hill Towers and low-rise buildings. 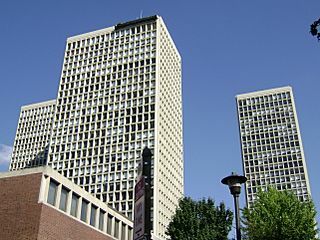 The Towers and townhouses project was completed in 1964, while the entire plan was completed in 1977. Architect Louis Sauer designed dozens of rowhouse projects for the area around Society Hill, including Waverly Court and Penn's Landing Square. 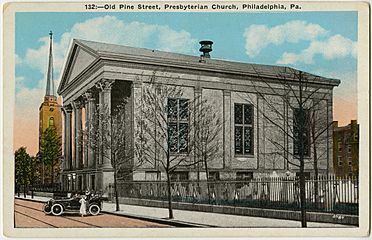 Historic buildings in Society Hill include the Society Hill Synagogue, built in 1829 as a Baptist church by Philadelphia architect Thomas Ustick Walter, one of the architects of the United States Capitol in Washington, D.C.. The synagogue was entered into the National Register of Historic Places in 1971. Another notable building is St. Peter's Church, constructed between 1758 and 1761 by Robert Smith. 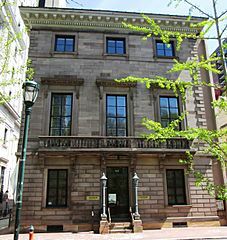 Congregation Kesher Israel occupies and has renovated the building constructed by the Universalist Church in 1796 at 412 Lombard Street. The Society Hill Historic District was listed on the National Register of Historic Places in 1971. 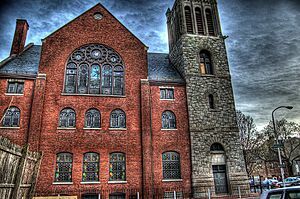 In 1999, it was listed on the Philadelphia Register of Historic Places. Source: Encyclopedia of Greater Philadelphia for 1860 and 1950 populations. Center City District for populations from 1970-2010. As of the 2010 United States Census, there were 6,215 people residing in Society Hill, which accounts for 0.4% of Philadelphia's total population. With 22,281 people per square mile, Society Hill's population density is about twice that of Philadelphia's 11,497 people per square mile. Society Hill's many historically significant congregations reflect the fruition of William Penn's Quaker maxim of religious toleration. Society Hill is accessible via several forms of public transportation. The Market–Frankford subway line stops at 2nd Street station and 5th Street station, which are two blocks north of Society Hill's Walnut Street boundary. The PATCO Speedline, a rapid transit system connecting Philadelphia and southern New Jersey stops at 8th and Market Street station, two blocks north of Society Hill, and at the 9th and Locust Street station, which is one block west of Society Hill's 8th Street boundary. The SEPTA 9 and 21 buses run westbound along Walnut Street. The 12 and 42 run westbound along parts of Spruce and Walnut Streets. The 12 also runs eastbound along Pine Street. The 47 runs northbound along 7th Street and southbound along 8th Street. The 57 runs northbound along 3rd Street and southbound along 4th Street. Since 2009, as part of a crosstown buffered bike lane pilot project, bike lanes were installed that run eastbound along Pine Street and westbound along Spruce Street. Society Hill is served by Indego bike-share stations at 9th and Locust Streets, 5th and Walnut Streets, Dock and Front Streets, and 2nd and South Streets. In the film National Treasure (2004) Nicolas Cage's character runs through the streets of Society Hill, the graveyard of Old Pine Street Church and Headhouse Market. Society Hill, Philadelphia Facts for Kids. Kiddle Encyclopedia.